This is a “brief” step by step of my latest painting. Its a tryptych …… had to look up the spelling of that one 🙂 …….. in oil paints as usual. 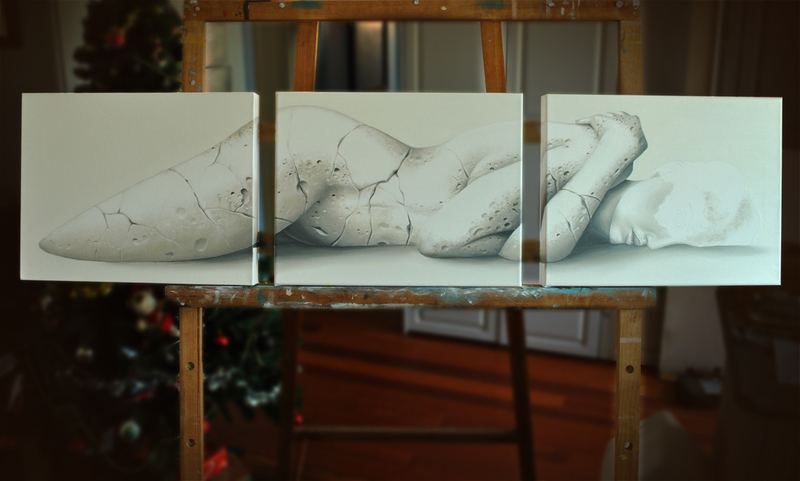 I am really getting into this stone look after my last painting titled “Facade”. I think i will do more of it in the next few paintings….. besides, I think I should maintain a theme for my exhibition next year. I am only going to include one or two pics in this step by step as I hope to have this one finished really soon. I have finally set up a facebook page and am inviting everyone to join. In the best traditions of transparency I will freely admit that the reason is one of “shameless self promotion” as I have recently found out THAT I AM HAVING MY FIRST EXHIBITION in 2014…..woooo hoooo 🙂 !!!!!!! As I am a lowly Melbourne Artist who is known only by my friends and family, I need to start drumming up publicity….. hence the facebook page, so I hope you have a look. I have added a facebook widget at the bottom of this page for people to use.